24-year-old Puneeth was enjoying his new-found adulthood like his friends at college when he discovered it might not last. 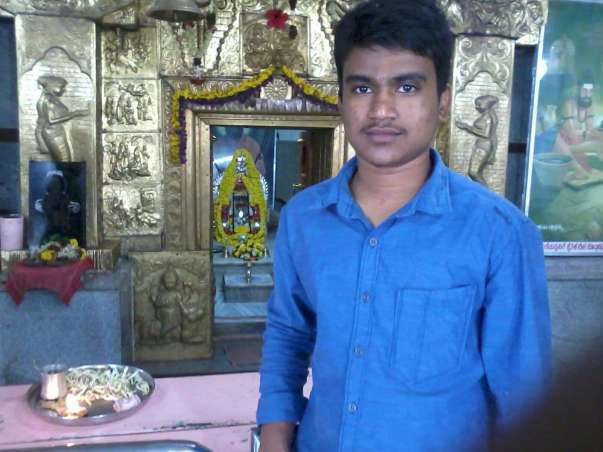 He was diagnosed with cancer in 2011, and ever since, Puneeth has been fighting hard to stay alive especially because he cannot afford the treatment expenses. 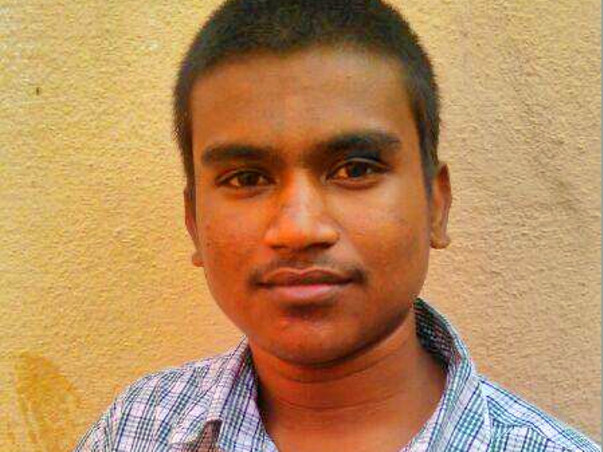 Now the cancer has metastasized, and Puneeth is in dire need of help to evade death. 2011, It was a normal day at college for Puneeth. He was pursuing his B.Com and looking forward to an evening of chitchat with friends. He just went to relieve himself when he spotted blood in his urine. Although he was worried, Puneeth shrugged it off hoping it was something he ate. Within a few hours, he had searing pain in the side of his stomach and his back felt like it was on fire. With intolerable pain, he reached the hospital where a doctor sent him in for a scan. Puneeth got the worst news of his life that day. He was diagnosed with Metastatic Paraganglia cancer, and the tumor was weighing on his kidney. Over time, Puneeth began working as an Auditor’s assistant for Rs. 4,000 so he would be distracted from the chronic pain, and also earn a living or a few thousand for his medical expenses. He was yet to complete his final year of B.Com and couldn’t take the exams because of the constant duress he was under after the initial surgery. In 2016, the pain won the battle. Upon further examination, doctors told Puneeth that cancer had metastasized to his liver, sacrum, head, and a few other areas. His only hope right now was Potomac Radiation Therapy that would help in treating the unresectable tumors. Since the cost of the therapy is too high, Puneeth is requesting help from generous donors like you to help him stay alive. Puneeth hopes to complete his B.Com this year. He has been studying hard and working harder. The people around him have been of great support during these terrible times, but they are of similar financial background. He has nobody to turn to at the moment, and his family appeals to you save his life. Puneeth's health condition is deteriorating slowly. He had to undergo a surgery due to increased pain. After the surgery, again he was admitted on 6th February for supportive care as he fell ill again. 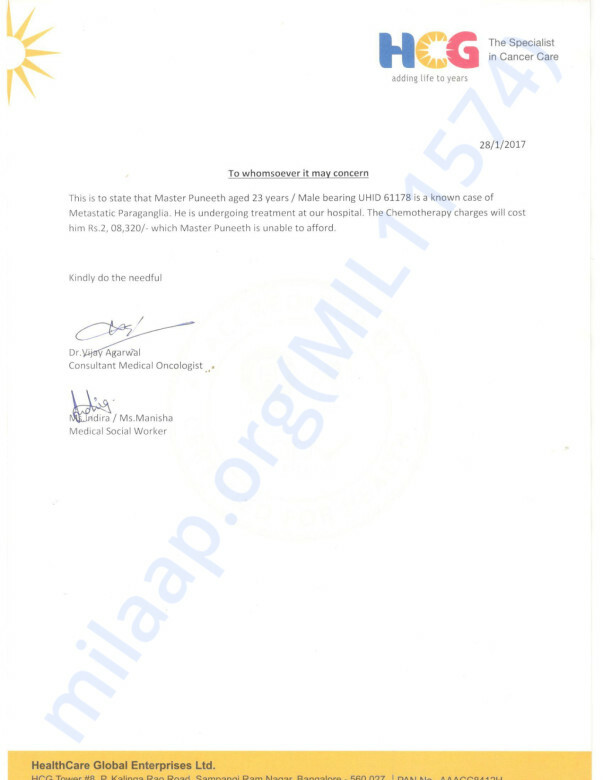 Cyberknife treatment was suggested for the treatment but due to his poor health he will not be undergoing cyberknife. We all pray for him to be better so that he can continue the cyberknife and hopefully recover. Thank you for the support that you have shown towards Puneeth's treatment. Due to severe pain Puneet got admitted to the hospital on 18th December for supportive care and got discharged on 21st December. He had to undergo an operation in the month of January 2018 and the operation cost was 1,95,000. He is not able to walk at the moment and is bound to a wheel chair. The doctor suggested to undergo radiation therapy for the recovery but he is unable to afford it and looking for more support from donors. Thank you for the support. Do share this campaign further with your friends and family. He completed his DOTA therapy on the 8th of last month and was discharged three days later. He was asked to go for a PET scan after which it was revealed that he needed to start chemotherapy. Thank you for all the support and please do pray for his speedy recovery.